What do you think of when fall arrives? Leaves changing color? Cool, crisp mornings? Calls of returning geese? Long walks? I live next to a park so I have been walking on these beautiful fall days and thinking about the little things we sometimes miss or don't think about while out in nature. On one of my walks, I spotted a "stick" with a yellow stripe that didn't look quite like a stick. I looked closely and realized it was a garter snake sunning itself. I started thinking about what else I'm missing when I don't look around for the small creatures and plants that live on the ground, in the tree trunks, under and in the logs, as well as the soil and trees. I now scan the ground as I walk and look among the leaves and rocks for the myriad of tiny creatures and plants that share this world with us. Nature is full of surprises, and they aren't all big ones. The next time you walk at the Tualatin River National Wildlife Refuge, take time to look at the creatures that cross your path or scurry under the leaves. Pay close attention to the intricacies of the plants that live underfoot. Look closely at the moss and lichens, and you will see the beauty in the small, overlooked aspects of the natural world. The holidays are coming, and the Friends of the Refuge group is looking for volunteers to work at the Nature's Overlook store located in the Visitors Center. 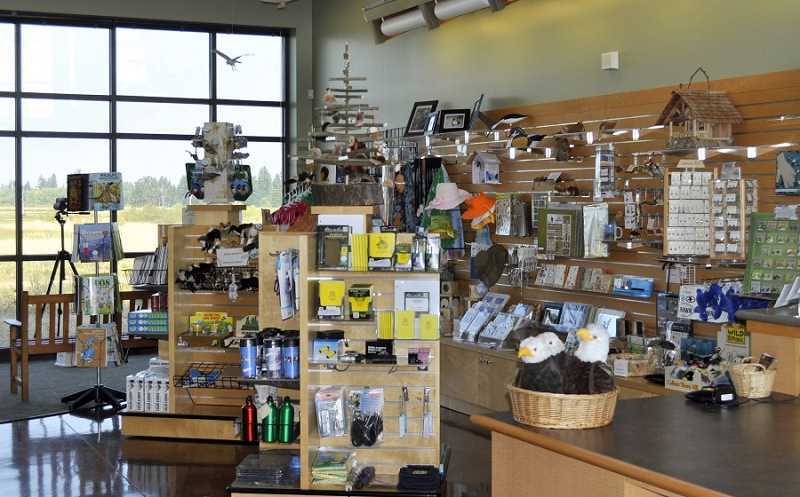 The store offers a selection of books on a variety of nature topics, field guides, a wonderful collection of children's books, logo clothing and gift items related to the refuge. It also features comfortable chairs, large windows and spotting scopes for those who prefer to enjoy the refuge from inside. Volunteers greet visitors, answer questions and sell merchandise. The store is open from 10 a.m. to 4 p.m. Tuesday through Sunday, and morning and afternoon shifts are available. If you are interested in volunteering, application forms are available at the store or on the Friends' website under the "Get Involved" link. The Tualatin River Photo Society will meet Thursday, Nov. 2, at 7 p.m. in the Visitors Center; participants should enter by the side door. Join us to learn about photo editing. The photo society offers programs, speakers and occasional workshops for anyone interested in nature photography. Whether you just want to learn more about photographing the natural world or want help with your new camera, you're welcome to join us. Owl Prowls will be offered Tuesday, Nov.7, and Tuesday, Nov. 21, from 6:30 - 8 p.m.
Whooooo goes there? Join the refuge's owl enthusiast Seth Winkelhake to learn why owls are outstanding hunters. These birds remind us that nature is still very active after the sun goes down. Learn about the different owls who call the refuge home and their mysterious nocturnal lives. Flashlights will be provided. Puddle Stompers will be offered Wednesday, Nov. 8, from 1 to 2:30 p.m. and Tuesday, Nov. 14, from 10 to 11:30 a.m. This preschool environmental education program invites children and their families to spend time learning about the natural wonders of the refuge. Volunteer naturalists will lead nature crafts, share stories and guide hikes on refuge trails. Programs are free and open to the public, but registration is required. For more information, call Seth Winkelhake at 503-625-5944. A Second Saturday Work Party will be held Saturday, Nov. 11, from 8:45 a.m. to noon. Meet the refuge, 19255 S.W. Pacific Highway, Sherwood, at 8:45 a.m. to check in and go to the work site around 9 a.m. Snacks and work gloves will be provided. Wear sturdy shoes and pants; plan for cold weather and rain; and bring a water bottle.